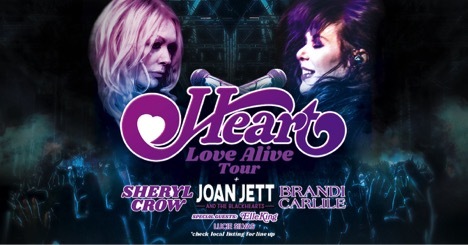 HEART—ANN and NANCY WILSON—will return to the road in 2019 for the first time in three years with their massive “Love Alive” cross-country summer tour. Produced by Live Nation, the expansive 39-city outing by the trend-setting, multiple-platinum Rock & Roll Hall of Fame legends kicks off Tuesday, July 9 at the Hollywood Casino Amphitheatre in St. Louis, MO and will make stops in Chicago, Atlanta, Houston, Denver and more, before wrapping September 9 at the famous Hollywood Bowl in Los Angeles, CA. Multi-platinum and multi-Grammy-nominated recording artist Elle King recently released her critically-acclaimed second album, Shake The Spirit, the follow up to her debut album Love Stuff, a sultry, badass mix of rock and roll, blues, and country, with a twinge of pop. Her breakthrough single “Ex’s & Oh’s,” earned her two GRAMMY nominations and was certified double platinum. The track, about leaving behind a string of brokenhearted exes, hit No. 1 on Billboard‘s Hot Rock Songs Chart, and topped the AAA, Hot AC, and Alternative Radio charts, leading King to become the second female artist in 18 years to reach No. 1 at the latter format. She was also featured on Dierks Bentley‘s GRAMMY-nominated No. 1 Country Airplay hit “Different For Girls” (she performed it with Bentley at the CMA Awards and took home an award for “Musical Event of the Year”). King also performed for President Obama in honor of Mavis Staples at the 2016 Kennedy Center Honors. This entry was posted in HEART, Press Releases. Bookmark the permalink.